Rasmussen Air and Gas Energy helps meet regulatory Food and Beverage standards by maintaining air quality and reducing contamination risk. Rasmussen Air and Gas Energy helps maintain a clean environment that reduces the risk of trace contaminants like oil or moisture. Rasmussen Air and Gas Energy's oil-free solutions ensure a clean, quality environment that is free of contaminants. Rasmussen Air and Gas Energy offers comprehensive solutions that support your needs including both long-term solutions and temporary options to help during peak times. 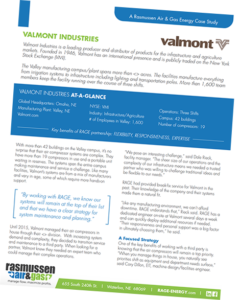 Rasmussen Air and Gas Energy sells and services the most reliable, cost effective solutions to support your manufacturing environment. As “An Add Value” organization, Rasmussen Air and Gas Energy is here to help improve your operations by providing custom, trusted services and support. We serve a variety of clients across multiple industries. Learn how we helped an international manufacturing organization improve system uptime, reduce personnel burden and provide ongoing service expertise.